Comparisons would definitely be drawn with the Zenfone 2, specially the ZE550ML which is at a similar price point. For the particular model of Zenfone 2, the storage are the same, although the Zenfone 2 does offer microSD support. As both the Zenfone 2 and Mi4i only offer 16GB of inbuilt storage, additional storage expansion through micro SD can be important, even a necessity for some. If you are looking to get this phone for the older generation, they might not be too familiar with cloud support and the ability to back up photos to a microSD card can be handy. You can’t really compare the processor head to head since Zenfone 2 sports an Intel processor but raw power wise would seem that the Zenfone 2 edge ahead. Antutu scores of the Snapdragon 615 is around 43000, with the Antutu for the Mi4i is around 38200. The Zenfone 2 sports only a 720P screen, albeit larger at 5.5″ as compared to the Mi4i 5″ 1080P screen. The Mi4i screen excels, and looks to be significantly brighter and more colour accurate as compared to the Zenfone 2. While you get more pixels with the higher end Zenfone 2 ZE551ML, which retails at $349 onwards, the screen looks washed out when placed side by side with the Mi4i. From ASUS perspective, a bump up to a 1080P screen is worth $50, when you look at the different variants of the Zenfone 2. The Zenfone 2 is dual SIM but only one SIM supports 4G, while the other is only 2G capable. On the other hand, the Mi4i has both SIM 4G capable, which could be a convenient feature for some. 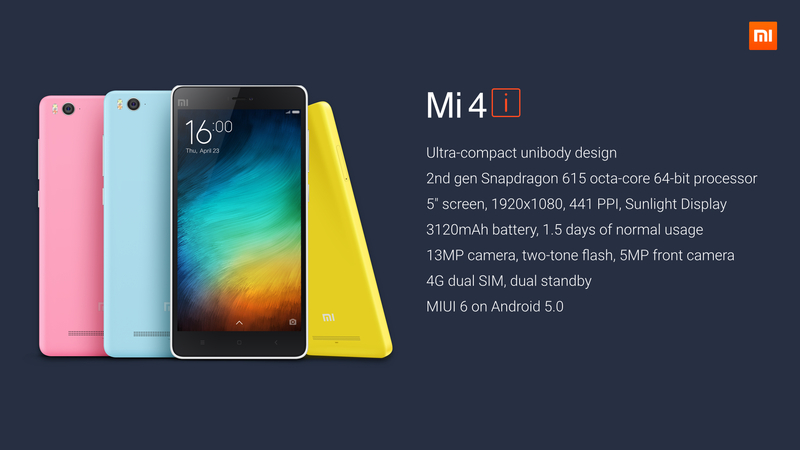 The Mi4i sports a 3,120 mAH which is significantly bigger than most phones in this category (on average, about 38% larger than similar 5 inch phones). It is even more amazing that Xiaomi is able to achieve this while keeping the weight to only 130G. The Zenfone 2 sports a 3,000 mAH battery, but will have to cope with the bigger display as well. While both phones sport Android 5.0 Lollipop OS, they are both heavily screen. The Mi4i comes with their MIUI v6.0, while the Zenfone 2 sports the ZenUI. It boils down to personal choice. Camera is a little tricky. The Asus Zenfone 2 houses a feature-rich 13.0-megapixel camera with PixelMaster technology, f/ 2.0 aperture, and 5mp front camera. The MI4i features a 13mp Sony/Samsung camera with dual-tone LED flash, f/2.0 aperture, and a 5mp front camera with f/1.8 aperture. Sounds similar on paper but this comparison from PhoneRadar gives the edge to the Zenfone 2 camera. Price plays a crucial role in the minds of the prospective value for money hunters, who are especially price-sensitive. The Mi4i price is fixed at $279 (for now), while the Zenfone 2 can be bought off Lazada, and with the right coupon code, can bring the price to around $249. Both phones have good plus points, the bigger screen and micro SD support on the Zenfone 2, compared to the better screen and more handy size of the Mi4i. I would go for the Mi4i since screen quality, and overall build and finish is quite important to me. The Asus Zenfone 2 is a good alternative, especially taking into consideration Xiaomi’s JIT order system which makes it notoriously hard to buy the phone. For the Zenfone 2, if you prefer it primarily for the bigger screen, do consider the slightly lower end variant, the ZE500CL, which has the same screen at $60 less. I think both phones offer a wide range of benefits however I would have to go for the Mi4i simply down to its specs. However I would like to give these phones a test to see how they perform in a real world scenario.